This is the company and the robot that Amazon has been contemplating to acquire to provide a complete automatic solution for the retail industry. 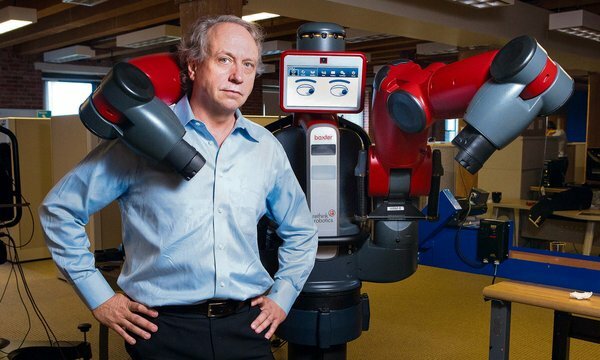 The last piece of the puzzle after Amazon’s Kiva acquisition for $775 M.
Baxter, the first product of Rethink Robotics, an ambitious start-up company in a revived manufacturing district, is a significant bet that robots in the future will work directly with humans in the workplace. Here in a brick factory that was once one of the first electrified manufacturing sites in New England, Rodney A. Brooks, the legendary roboticist who is Rethink’s founder, proves its safety by placing his head in the path of Baxter’s arm while it moves objects on an assembly line. The $22,000 robot that Rethink will begin selling in October is the clearest evidence yet that robotics is more than a laboratory curiosity or a tool only for large companies with vast amounts of capital. Baxter will come equipped with a library of simple tasks or behaviors. Rethink itself has made a significant effort to design a robot that mimics biological systems. The concept is called behavioral robotics, a design approach that was pioneered by Dr. Brooks in the 1990s and was used by NASA to build an early generation of vehicles that explored Mars. Dr. Brooks first proposed the idea in 1989 in a paper titled “Fast, Cheap and Out of Control: A Robot Invasion of the Solar System.” Rather than sending a costly system that had a traditional and expensive artificial intelligence based control system, fleets of inexpensive systems could explore like insects. It helped lead to Sojourner, an early Mars vehicle. The next generation of robots will increasingly function as assistants to human workers, freeing them for functions like planning, design and troubleshooting. Rethink’s strategy calls for the robot to double as a “platform,” a computerized system that other developers can add both hardware devices and software applications for particular purposes. It is based on open-source software efforts — including the Robot Operating System, or ROS, developed by the Silicon Valley company Willow Garage, and a separate project called OpenCV, or Open Source Computer Vision Library. That will make it possible for independent developers to extend the system in directions that Rethink hasn’t considered, much in the same way the original Apple II computer had slots for additional peripheral cards. “We will publish an interface for the end of the wrist,” Dr. Brooks said. That will mean that while Baxter comes with a simple hand, or “end effector,” it will be able to adapt the system with more complex and capable hands that will be able to perform tasks that require greater dexterity.